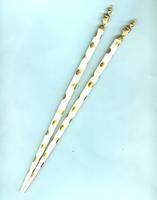 Fashion jewelry never looked so luxurious before these ivory and gold colored hair sticks came along! With its golden glass pearls and gold plated findings, these long wooden hair sticks look like something an Oriental potentate might gift to the loveliest lady in the land. They measure 10-1/4" overall, and the wooden portions are painted a rich ivory with metallic gold spots. Feel like a queen, but have the purse of a pauper? SPARKLE PLENTY thinks that?s no reason not to look like a queen.